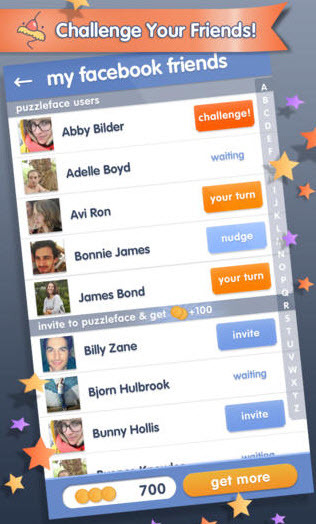 PuzzleFace allows you to compete with random players online or with your Facebook friends. When you start a new game you are asked to pick a theme that ranges from movie stars, to animals and fashion. This theme will dictate the images that show up during your games. There is also a â? ?shuffleâ? theme that will shuffle different images from all themes. 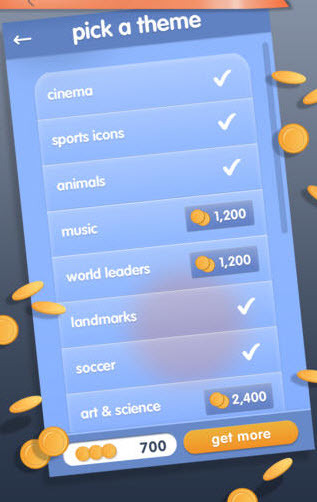 Once a theme is selected, you and your friend are put into the first round. A blurred image will appear, and you have 20 seconds to pick the answer that corresponds to the image. If the image is too blurry, you can spend a â? ?un-blur creditâ? that will make the image clearer. You can also add more time or eliminate two wrong answers to cheat a little. However you will have to watch out: un-blur, time and elimination credits are limited. You can always purchase more credits using your in-game coins. Depending on who gets the most right answers, or who answers the fastest, a winner will be determined. 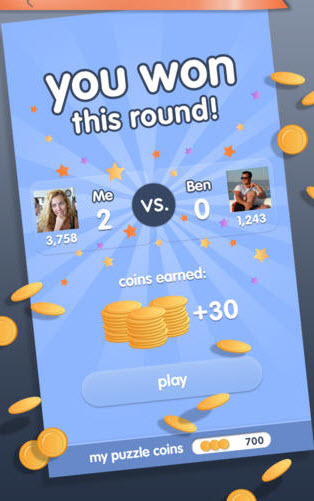 The winner will get a hefty amount of coins which they can use to purchase more themes and un-blur, time and elimination credits. Games with friends and online players are not in real time though. Each player goes through five rounds, and then itâ? ?s the other playerâ? ?s turn to do the same. Games therefore could take anywhere from 10 minutes to 10 days to complete depending on how fast the other person gets their rounds done. If the person youâ? ?re playing with takes too long to finish their rounds, you can always â? ?nudgeâ? them to give them a reminder. This game is not only free but also fun to play with friends. Itâ? ?s a great way to pass time and easier to play than an intense game such as Ruzzle. Not to mention that there are over 1,500 celebs and over 7,200 puzzles in total. 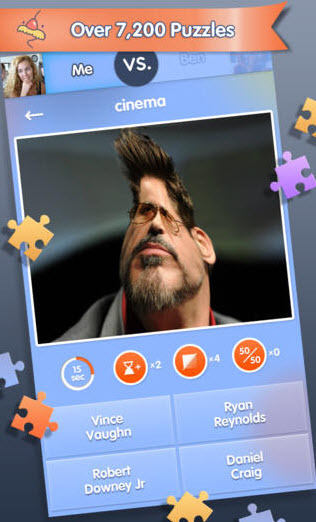 There are no in-app advertisements in PuzzleFace, which is really awesome. PuzzleFace also has a â? ?My Statisticsâ? section that shows your amounts of wins, losses, and the theme you perform best under. It would be nice if there was an in-app chat system to message other people while waiting in-between rounds. If you like social puzzle games, then PuzzleFace is the right game for you. Considering that itâ? ?s free, you have nothing to lose by giving it a try.